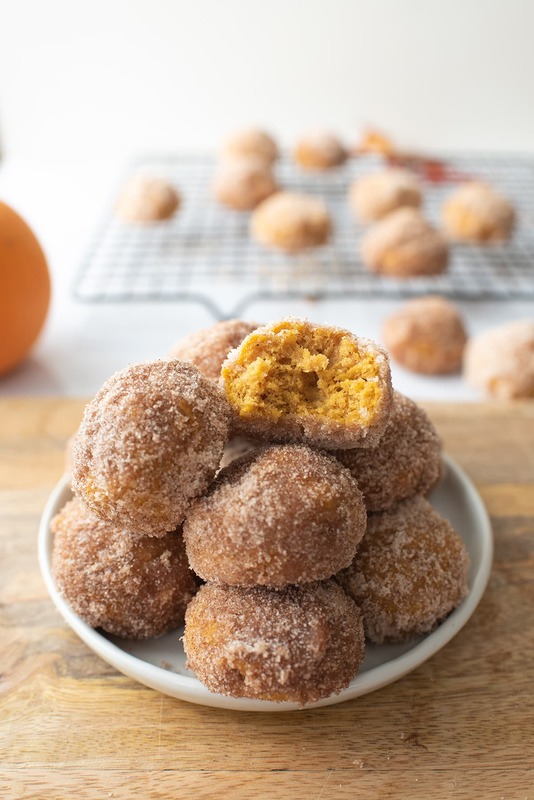 Few baked things announce Fall more that your stoned roommate and the “Welcome Fall!” sign he decided to hang on the front door last night (subtlety is his love language), but at least these baked Pumpkin Donut Holes rolled in cinnamon sugar are edible. Back to the Pumpkin Donut Holes. 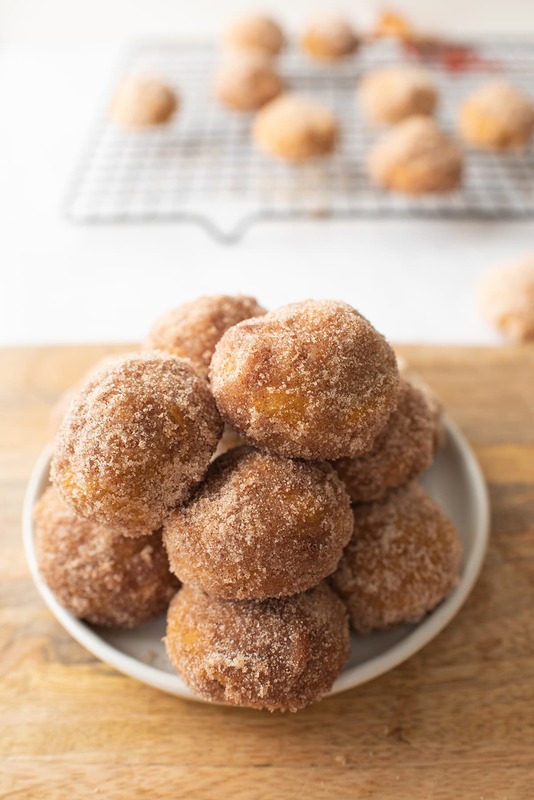 I like a classic donut as much as more than the next person, but if you want pumpkin donuts and don’t want to deal with frying or waiting around for eight hours while dough keeps telling you it’ll be just five more minutes, bake these. These donuts are really easy to make. Preheat the oven to 375°F. Then, take your dry ingredients (flour, brown sugar, pumpkin pie spice, baking powder, and salt) and stir those together in one bowl. In your other bowl, beat an egg, add the pumpkin puree, vanilla extract, and milk, and whisk all of this together. Add the pumpkin mixture to the dry mixture and stir this together until it’s completely combined. Then, add the melted butter and stir it in until the mixture is an even consistency. Grease the mini cupcake pan and add one tablespoon of dough to each cavity. Bake for 10 minutes or until they bounce back when pressed gently and let cool on a cooling rack. When the donut holes have cooled, dip them in melted butter, shake off the excess and roll them in the cinnamon sugar mixture. And that’s it! 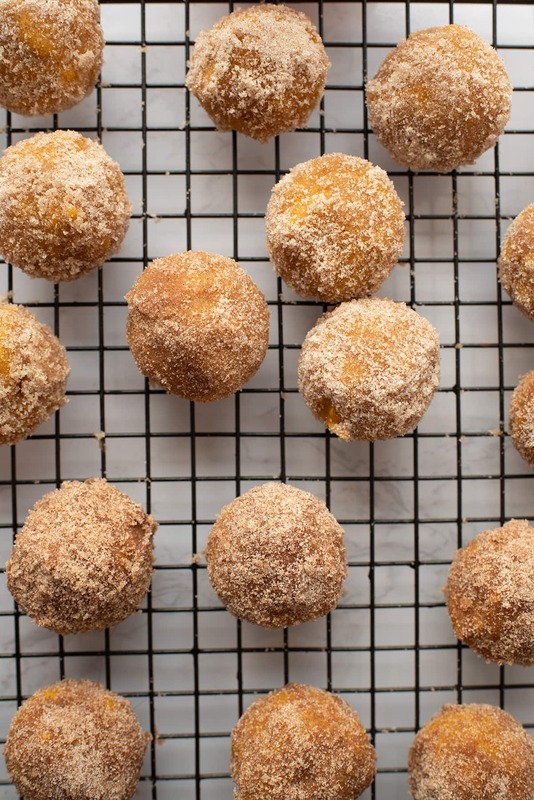 These pumpkin donut holes rolled in cinnamon sugar are an easy way to easy way to capture the flavors of fall. Preheat oven to 375° F. Grease mini cupcake tin. Set aside. Whisk flour, brown sugar, baking powder, salt, and pumpkin pie spice together in medium bowl. Set aside. Beat egg in medium bowl. Add milk, pumpkin puree, and vanilla extract. Whisk until fully combined. Add egg mixture to flour mixture and stir until fully combined. Add melted butter. Stir until combined. Transfer 1 tablespoon of batter to each cupcake tin cavity. Bake for 10 minutes or until donut holes bounce back slightly when pressed. Remove from oven and let cool on cooling rack. Combine cinnamon and sugar in small bowl. Set aside. Once donut holes have cooled, dip each in melted butter. Shake off excess. Roll in cinnamon sugar. I LOVE that these are baked instead of fried. My mouth is watering just looking at that cinnamon sugar coating! Dang these look good! I’m so making these and “pairing” them with a cup of hot coffee. Love that they’re not fried. Thank you! I bet they’d be so good with coffee! Or chocolate! So glad you like it! Let me know what you think! I love everything pumpkin related this time of year. These donut holes look amazing! I definitely like that these are baked rather than fried and they look great too! I wish I could grab those right off the screen. I am totally loving these donuts. I love that you made these little donut holes in a mini cupcake pan. So much easier than fried. 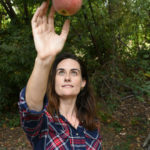 Such a fun recipe for fall!